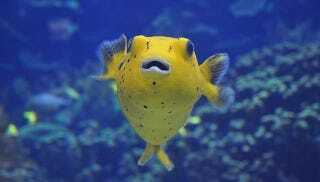 Puffer fish poisoning has claimed many victims. While the fish’s poison was well-known to the people who lived near its habitat, explorers ate it without a second thought. This proved bad for them, but much worse for their pigs. Tetrodotoxin is, in small doses, pretty nice. Not only is it known to get people high, it’s a mild pain killer. The toxin blocks nerve impulses. At low levels, that means nothing more than numbness, though some people complain of a burning or pins-and-needles sensation. As the toxin levels in a body go up, more and more nerves get temporarily disabled, including the ones in the diaphragm that keep us breathing. Too much puffer fish, and we suffocate. Since there’s no risk a person won’t take to get stoned, plenty of cooks did and do serve puffer fish, but only after they are trained in how to prepare the stuff. They have to cleanly take out the internal organs, including the liver and the ovaries, which store enough tetrodotoxin to kill a person. It seems that Captain James Cook’s chef wasn’t clever with a knife. On Cook’s second journey around the world, the ship took culinary advantage of the local flora and fauna. Journals of the time talk about how much the Captain liked local food like breadfruit and coconuts. It seems he also fished, and on September 7, 1774, he and his naturalist both ate a new kind of fish. Within an hour their hands went numb. A little while later, they felt as if their hands had been put in snow for an hour and then set on fire. It was an uncomfortable night, but one from which they both recovered. Not so lucky was the not-so-local food that Cook had brought on his journey. Long-voyage sailing vessels often took along pigs, goats, and chickens. Some of these animals would be off-loaded onto islands, where they would multiply and provide a renewable source of food for later voyages—as well as devastate the local environment. Some of the animals were meant to be food. Pigs were convenient food for long voyages because they could be fed on whatever scraps the crew wouldn’t eat, including the innards of fish. Both pigs, eating the scraps from the puffer fish, got a lethal dose of the toxin, making them the first recorded western casualties of puffer fish poisoning.